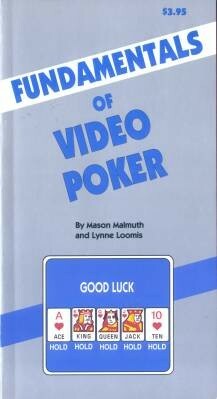 Fundamentals of Video Poker by Mason Malmuth and Lynne Loomis discusses the most popular forms of video poker - jacks or better, tens or better, deuces wild, and joker wild - that are found in most major casinos throughout the country. It covers everything from the mechanics of play, the ranking of hands, standard and progressive machines, and full pay machines to the most important strategy considerations that are necessary just for basic survival. All books are must reading for anyone new to these games or to anyone who does not understand the basics of these games and who would like to do better. Each text includes quizzes which are designed to not only help you learn the material better, but to make your play in a casino or cardroom much more enjoyable.